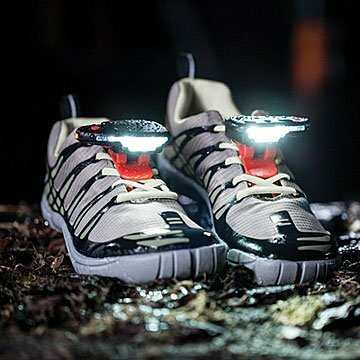 Light your way to a safe night run with these clip-on shoe lamps. While training for the Boston Marathon, runner and designer Doug Storer injured himself when he hit a pothole he couldn't see in the dark. You might say a light bulb went on for Doug that night and he designed a pair of lamp clips for your shoes that light your way without getting in your way. They provide 270 degrees of visibility in front plus two rear-facing taillights, making you instantly visible to traffic from all sides. Their shoelace positioning also means the light is exactly where you need it, so potential hazards are easy to spot and avoid. Each unit fastens securely to your laces with a stable, adjustable bracket. Housed in high-impact, water-resistant cases, they're powered by Li-ion rechargeable batteries with a micro-USB port and included "Y" connector to charge both units at the same time. Great for both urban and trail running, they're a safe bet for any avid runner. Includes storage case. Designed by Doug Storer. Made in China. Sometimes, calamity is the mother of invention. Runner and designer Doug Storer was training for the Boston Marathon and injured himself when he hit a pothole that he couldn't see in the dark. You might say a light bulb went on for Doug that night. His Night Runner lights aim to combat this statistic: every eight minutes, a runner, walker, or cyclist gets hit by a vehicle, and more than half of these accidents occur after 6 p.m. Observing that runners all lead busy lives and the only time for some to get out is after sundown, he decided to shed some light on the situation. This was the perfect gift for my sister and brother-in-law! They are constantly training for races and do a lot of long distance running where they live, which can be foggy at lot. The lights are great not only for dark, but for other types of weather, too! I like to jog with my dog very early in the morning before work; My neighborhood doesn't have street lights, and these are a great hands free light to see the road and any debris/bumps/holes in it. They also attach to my hiking boots. Added bonus it illuminates my pup just a bit to keep eye on what she's doing and for cars to see her earlier too. I will buy this for all my special people that are outdoorsy, When they saw the gift I got my brother in law, everyone wanted them. I am not a person who trusts websites but this was awesome and I am so thankful that the gift came on time and was such an awesome present. It's hard to know who to trust on what websites but this is great and I want to thank you for helping me find the perfect gift. Your catalog is great as well. Again, thanks for helping me believe in great websites, I will be ordering again and again. My husband hasn't used these yet but was happy to get them. USB rechargeable, water resistant, gave great views of road to reduce injury. A very helpful product to try to keep runners safe while they run at night! Great for early morning & late night runs. Hope I get a set! Great present. Am going to buy more for presents. Hope someone buys a set for me!